Any architect would feel the pressure of designing in the shadow of Louis Kahn’s iconic Kimbell Art Museum in Fort Worth, Texas, often referred to as “the mecca of modern architecture.” Andy was introduced to then Kimbell director Timothy Potts at the suggestion of the Morgan Library director Charlie Pierce just after the Morgan completed its expansion project by Renzo Piano. The Kimbell already considered Piano its preferred design candidate. The museum client team knew exactly what it wanted—it was impeccably prepared—and Paratus had only to organize the planning into a program document. We were not initially hired for services beyond the program. However, after early worries about proper space accounting and budgeting, the museum brought us back. 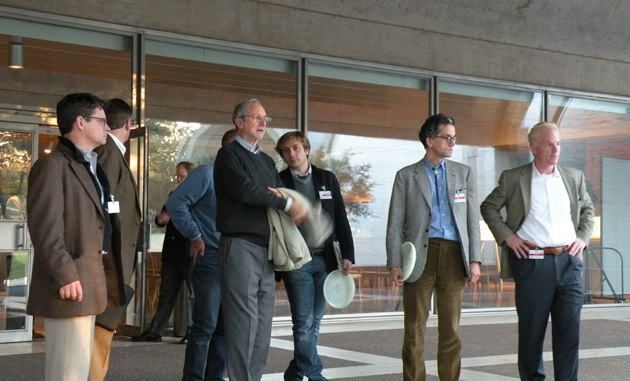 We managed all aspects of the Kimbell project thereafter. There were two great adventures in building the Piano Pavilion. The first was carefully calibrating the relationship between the two buildings. In this, Kimbell patrons Ben and Kay Fortson had an incredible dialog with Piano, supplemented by pacing distances repeatedly across the great lawn. The new building had to be humble and deferential, but as Piano said, “not too humble.” During this dialog the building moved up and down and back and forth many times before the final plans were settled. The Forstons stood as staunch defenders of the allee of trees and the green space between the two buildings, feeling an obligation to Fort Worth to return as much of the great lawn as possible. And Piano listened. The second adventure was the concrete. A Venetian company was hired to create “the best concrete walls in the world.” Each pour was labored over by a large team of specialists overseen by Dottor Group, the company responsible for the Punta Della Dogana gallery restoration. Paratus negotiated the contracts for all the participants and organized an extensive mock-up program before the first public wall could be poured. There was a meeting after every pour to discuss what worked and what didn’t. The process is well captured in the video below. 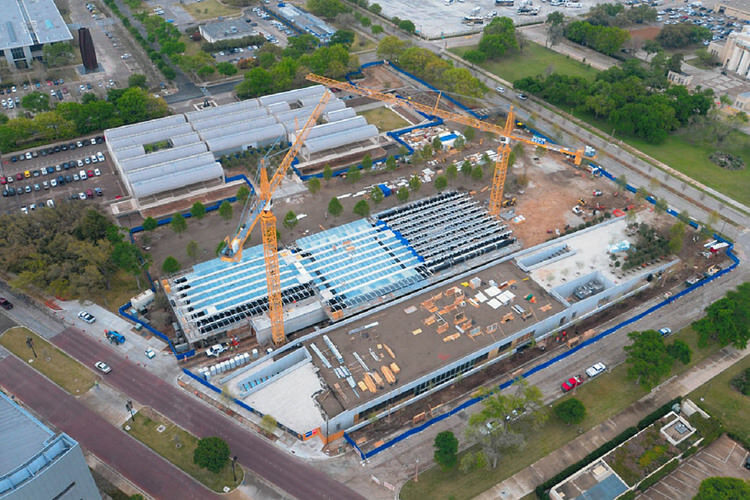 We worked through every detail with Beck Group, the construction management firm, and the architect, in addition to providing oversight for the entire project budget. There is no detail too small to warrant our full attention, and this building now stands as testament to everyone’s dedication to detail. Mr. Piano’s pavilion design aims to complement Kahn’s monumental modernist aesthetic, his fondness for concrete and his emphasis on light. “I understood that we needed to create a dialogue between the two buildings,” Mr. Piano wrote in an email. 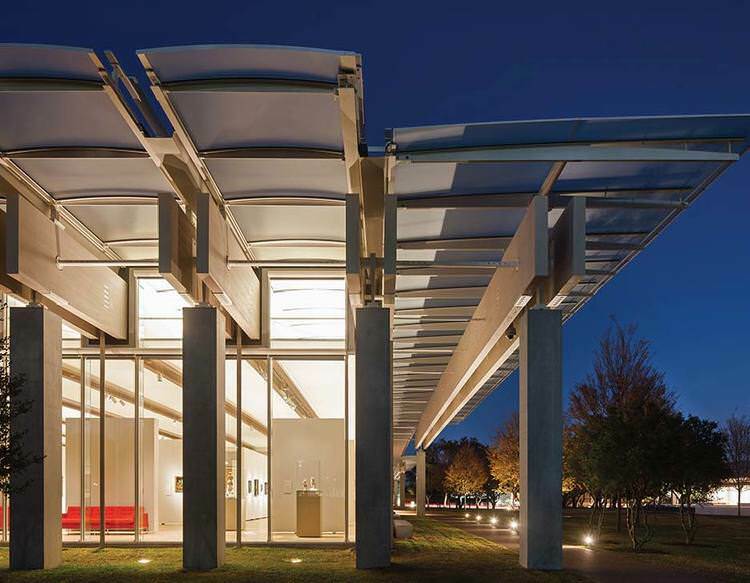 Renzo Piano Building Workshop and Arup join forces to create a contemporary lighting scheme for the new Renzo Piano Pavilion at the Kimbell Art Museum, one that keeps the original work of Louis Kahn and Richard Kelly in mind. One striking aspect of Piano’s scheme is the gracefulness with which it restores the threshold experience of the Kahn museum to Kahn’s original vision, so that once again the majority of visitors will enter as intended through the main west entrance and tree-lined court, flanked by pools and vaulted porticos. Subtly echoing Kahn's building in height, scale and general layout, the RPBW building has a more open, transparent character. Light, discreet (half the footprint hidden underground), yet with its own character, setting up a dialogue between old and new. The new building consists of two connected structures.